This is another recipe I found on a site with links to I think 30 slower cooker recipes. I've made it twice and it turned out great both times. The credit for this recipe and image goes to Ali at Gimme Some Oven. What's wonderful is you let the slow cooker do all the work early on and we all know that slow cooking really helps develop the flavors of the ingredients. Then you use a couple of forks to shred the meat, put it on a cooking sheet and crisp it under the broiler. I need to wrap my mind around other uses for this cooking technique as I think it has great potential. 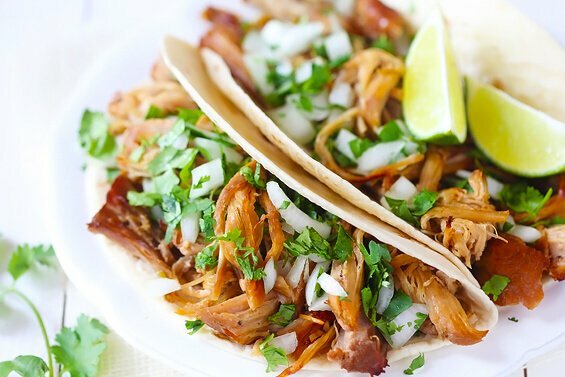 What to do with Pork Carnitas meat once cooked? Well first and foremost is to wrap the meat in a small warm flour tortilla and serve with lime wedges and chopped cilantro. 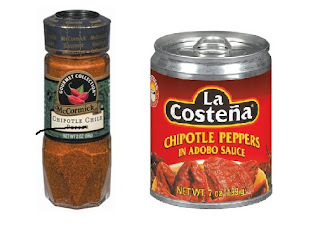 You could also use it in burritos or enchiladas, make carnita hash (fried potato and onion with carnita meat, seasoned to taste, and sometimes topped with a fried egg) or to top a Mexican style meal-size salad (would pair well with other salad ingredients like jicama, red pepper and avocado). I even found this unique recipe for Carnita Tamale Pie (untested) - http://pinchofyum.com/carnitas-tamale-pie. And Your Trainer Paige offered these three unique options - http://www.yourtrainerpaige.com/2013/01/3-ways-to-use-up-leftover-carnitas-and-untraditional-meals-wiaw/. Heat oil in a large skillet over high heat. Add the pork in small batches and sear on each side until browned (about 2 minutes per side). Transfer pork to the slow cooker. Add remaining ingredients to slow cooker and give the mixture a careful stir to combine. Cook on low for 6-8 hours until the pork is completely tender. Shred with 2 forks right in the crockpot full of flavorful juices. You can serve the meat at this point as is, or make it extra special by crisping the meat using the following method. Preheat your broiler to high heat and prepare two baking sheets with aluminum foil. Use a slotted spoon to transfer the meat to the prepared baking sheets, spreading it out evenly in a single layer. Reserve the remaining broth from the slow cooker. Place one sheet under the broiler for about 5 minutes, or until the edges of the pork begin crisping up. Remove the sheet, and use a spatula or tongs to carefully toss the pork. Then ladle about 1/4 cup of the remaining slow cooker broth over the pork. Broil for an additional 5 minutes to get the meat more crispy. Then remove and ladle an additional 1/4 cup of broth over the crispy pork. Repeat with the other baking sheet of pork. Serve immediately or cover and refrigerate. You can also freeze for later use..